For Disney lovers, the chance to dine with your favorite characters is an opportunity you won’t want to miss! I have wonderful memories of having breakfast with Mickey and Minnie as a child, and it was one of the things I couldn’t wait to do with my own children. When we took our twin toddlers on their first trip to Disney, we weren’t sure how they were going to react to the characters. But while in the Magic Kingdom our first day, we happened upon a hidden gem. Just past the Dumbo ride, there is an area where you can meet Donald, Daisy, Goofy, and Minnie. Since the area was pretty much deserted, we decided to give it a try. And Mia and Miles LOVED it! 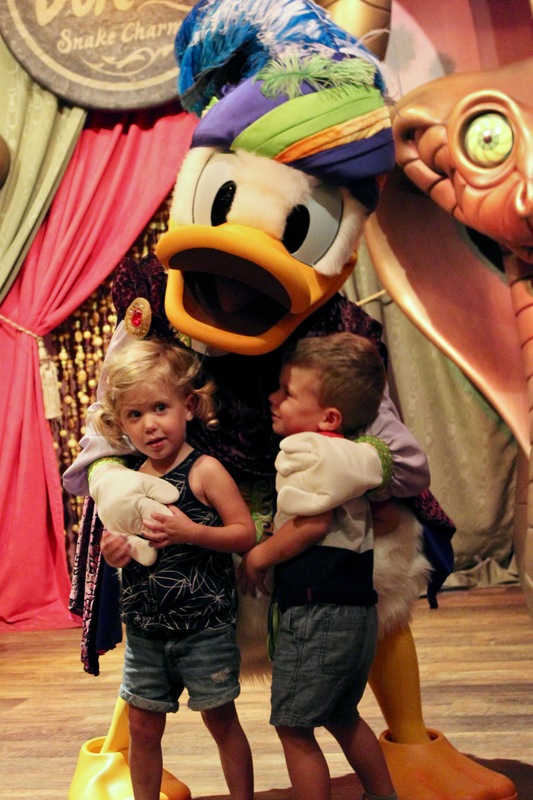 They were beyond excited to give their favorite characters hugs. So excited, in fact, that it was hard to get a picture of them facing the camera. So when their third birthday grew near, my husband and I decided that rather than throw a big party, we would take them to have a special meal with their idols. Disney Character dining has come a long way since my childhood in the 80’s. Today, there are several different options tailored to a variety of character experiences and food preferences. You can dine with princesses, the Disney Jr. stars, or your favorite Pooh characters. All four parks and many of the resort restaurants offer character meals. My advice would be to read up on your choices and book early. Reservations can be hard to come by. I actually made mine about 4 months in advance, knowing I could cancel if our plans changed. Since we only live about an hour away, we planned our reservations for a day we were not planning to go into one of the parks. We didn’t want to have to rush. We chose Chef Mickey’s restaurant inside the Contemporary Hotel for a couple of different reasons. First, we wanted to see the “Fab Five” – Mickey, Minnie, Pluto, Goofy, and Donald. Plus the monorail goes right through the middle of the hotel, in full view of the restaurant, and the monorail was one of my son’s favorite parts of our Disney trip! I would guess that many of the guests were parents just like me, recreating some of their happiest childhood memories with their own kids. But like everything else at Walt Disney World, nostalgia doesn’t come cheap. Character dining can be expensive. Prices hover around $40 for adults and $30 for children and vary according to the meal and restaurant you choose. I just kept reminding my husband I was actually saving him money by choosing an experience over a party! 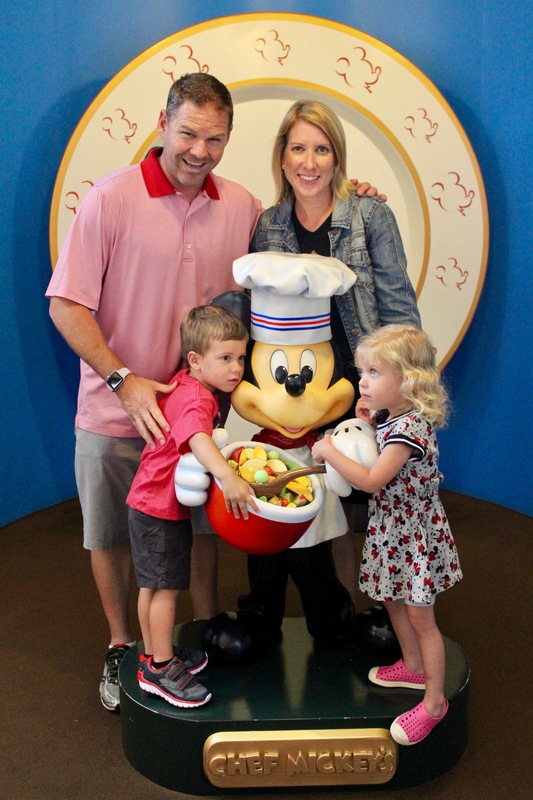 The food at Chef Mickey’s was the least impressive part of our experience. They were serving brunch while we were there, and the menu was pretty standard. In addition to eggs, bacon, and potatoes, there were plenty of kid-friendly favorites like Mickey-shaped waffles, mac and cheese, and chicken nuggets. Honestly, I don’t think my kids ate a bite. They were completely mesmerized by the characters and way too excited to eat! Mickey and the gang circulated through each section of the restaurant, taking time to stop at each table for hugs, autographs, and photos. We took our time and were actually there long enough to see each character twice. The wait staff never made us feel rushed. We took (literally) hundreds of photos and M&M hugged each character to their little hearts’ content. In the parks, you can wait for a LONG time to have a quick character interaction, so in that respect you get a lot of bang for your buck at a character meal. The only drawback is that your photos aren’t quite as picture perfect. You have a lot of visual clutter in the background, mainly other families and their dirty dishes! Whether character dining is part of your family vacation or just a special experience for us locals, it is sure to be a memorable day for your family. I know our first character meal won’t be our last. Mia and Miles still talk about the day they got to have lunch with Mickey and Minnie. Do you have a favorite character dining experience? Please let us know in the comments!